Start a healthy lifestyle right now! GNC Hair, Skin & Nails Formula is a specialty nutritional formula scientifically designed to promote beauty from the inside out. Adequate intake of essential nutrients such as Biotin, Lutein, and amino acids, along with important antioxidants, helps support beautiful hair, skin and nails. Biotin Supports normal cell growth in the hair, skin and nails matrix. 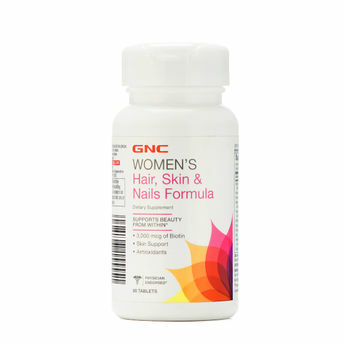 Each serving features 2,500 mcg of biotin.